A beautiful bay window enhances the facade of this country home. The foyer opens directly into the living room, which boasts a lovely central fireplace. The bay window brightens the room with cheery natural light. A handy pass-through from the island kitchen to the living room makes entertaining a breeze. A handy serving bar faces the dining area, which is lit up with windows facing the backyard for pleasant views. Around the corner, a staircase leads to a bonus room, which can be finished for a future bedroom, if desired. In the sleeping wing, the master bedroom boasts a cute built-in bookshelf. The master bath offers a large walk-in closet, a separate tub and shower, and a private toilet. Down the hall, two good-sized secondary bedrooms share a full bath. Laundry facilities are just steps away from all three bedrooms. 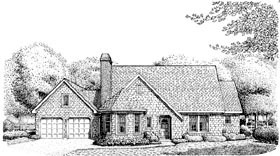 All elevations, floor plans with dimensions, slab foundation layout, sections, and roof plan. They are “stock plans” and you will need to make them work for your area and meet your local codes and requirements. Most of this can be done through your general contractor or custom builder.